It just doesn’t get much better than homemade bread. There’s nothing like it when it’s fresh out of the oven and topped with a dollop of butter or some peanut butter and jelly. In our house, I leave the “real” bread-making up to Therese. There’s no way I can top the bread — or the buns — she bakes. I’ve never had a better piece of toast than those that have been sliced from a loaf of her homemade bread. But when it comes to “other” breads, the ones made with bananas, zucchini or pumpkin, that’s my domain. 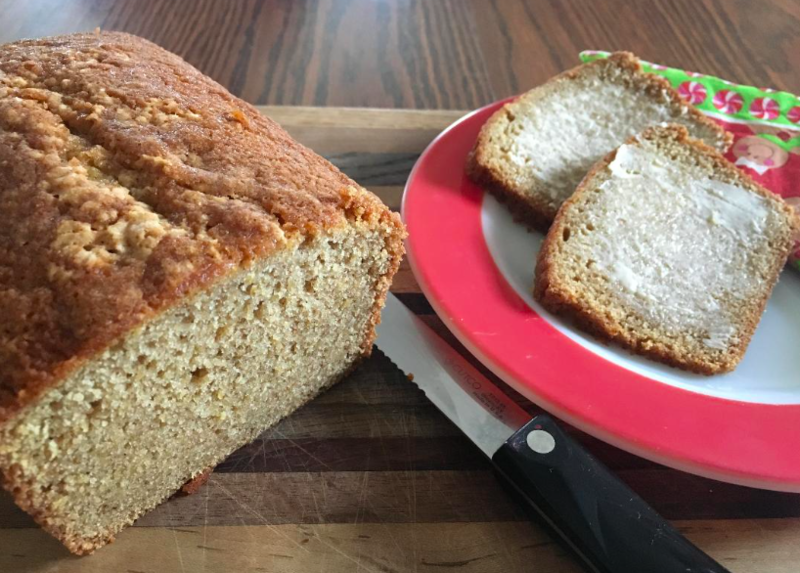 I have a couple of banana bread and zucchini bread recipes that are hard to beat, but it’s the one for pumpkin bread that’s really become a family favorite these days. This past summer, I had a bumper crop of squash and pumpkins, so when fall rolled around, most of them ended up in the garage — some went to neighbors and the food shelf — until the temperatures became too cold and they were transferred to our basement cold room, where the temperature stays between 45 and 50 degrees. Unbelievably, we’re still eating squash; only a couple spoiled on us. (Can you believe it? It’s April!) The same was true for the pumpkins, although I cooked the last one this past weekend. And if you guessed that I used it for pumpkin bread, you would be correct. Pumpkins, like squash, are best cut in half before they are placed in a heated oven. I’ve found that lining a cookie sheet with tinfoil is the best way to cook squash or pumpkins. That way there is no mess to clean up. And since the inside of cooked pumpkins can tend to be a little stringy, I puree it before using to make bread. The last pumpkin was a bit on the smallish side but big enough for two breads, one for us and one to send to our grandson, Rakeem, who is going to school in Cincinnati. He’ll also get a loaf of Grandma’s homemade bread. And just for the record, he loves Grandman’s bread toasted. Cream shortening and butter. Add sugar, eggs and pumpkin. Mix dry ingredients and then add to creamed ingredients. Mix thoroughly. Place in two greased 2½-by-8-inch pans. Place in preheated 350-degree oven. Bake for 1 hour. Use the squash as your ‘pumpkin’ for more flavor. Pumpkins are grown for looks and not flavor these days. Kinda like those “Delicious” variety apples — that aren’t delicious. And give your squash a diluted bleach rinse and dry in the sunshine before you bring them in. Although the best thing is to be be careful when handling and not nick the skins.